Back in my teen years I was definitely one of those girls who wanted to be a Myspace scene kid. I was into my popular rock music, Green Day, Avril Lavigne, Fall Out Boy... You know. All those guys! I spent ages on the Myspace with my friends at the time and only wanted to buy alternative clothing, get that Myspace hair and try skateboarding. Problem was, I was never any good at it but I actually wanted to skateboard! I did although have a penny board which I loved and found a lot easier than my brother's regular skateboard. Recently I got an email from Librance.com asking me to check out their store and when I did it took me back to my teen years after coming across their penny boards! Back then, I had a regular plain blue one with white wheels I think - I mainly remember it being blue. But looking at these designs, it took me back to those teen years. Though I cringe at the whole Myspace scene kid thing, I did find trying to balance and ride a penny board a lot of fun and wish I could ride them properly now. This penny board particularly caught my eye because of the awesome bright design. It's simple and white on top and all graphic fun at the bottom. This is the sort of thing I would have picked up if I were buying myself a penny board in my teens. I kinda wanna buy it now anyway! 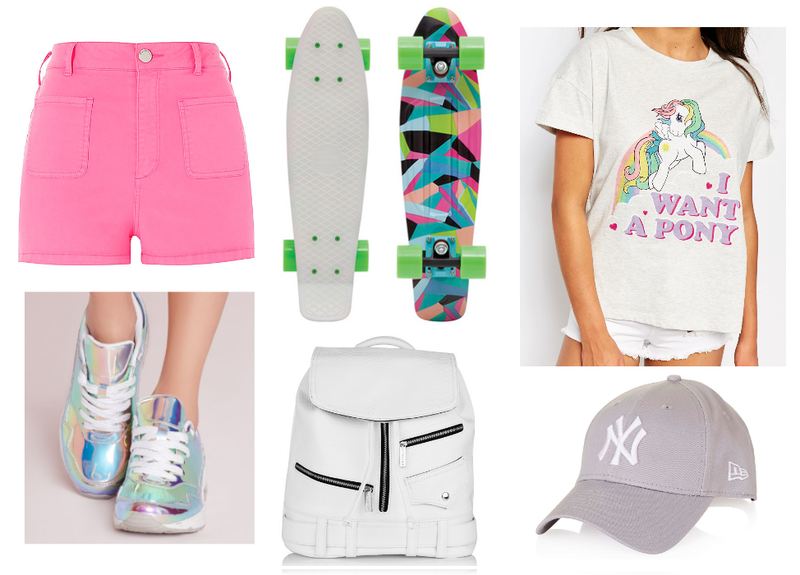 I thought it would be fun to create a skater girl outfit wishlist based around the board and I whilst doing so, came across a few things I'd really love to have in my wardrobe. Those holographic trainers are a guilty pleasure because they're so out of the box and I know how much my family and boyfriend would hate them! (Teehee) I'm also really lusting over that white backpack from Skinnydip London - perfect for days out when you need to be hand free yet still rocking a good look. And I simply love those shorts in pink. I have them in bright blue already so I know how great they look on! What were you like as a teen? Were you a Myspace gal like me? Haha! This is such a cute wishlist!! I love that top, so cute! !